For those of you who are thinking of moving home after you retire, one of the main considerations will be whether you can afford to do so and, if so, what type of property are you looking for and where you intend to move to. Most of these issues will be determined by the kind of provisions you'd set in place whilst you were still working. You'll no longer have your regular income from work coming in so you'll no doubt be relying on things like pensions, annuities and other investments and savings you've accrued to determine what your options might be. You need to ensure that you have a firm grasp on the total amount of your expenses each month before you should even consider looking to move home. The only true way to achieve this is to sit down and work out exactly how much money you have coming into and going out of your house each month and it's necessary to factor in things like price increases and estimated effects of inflation too. An independent financial advisor can help you in these matters. If you own a larger property, it may well be worth considering downsizing to a smaller home. In doing that, you can free up some money to put towards your new home whilst perhaps still having a substantial sum left over which you can use to provide you with an additional regular income during your retirement. A smaller property will also possibly result in less expensive utility bills and prove less costly for things like regular maintenance, for example. Equity release is another way for you to finance a house move in retirement but it's not the ideal solution for everybody and it's crucial that you seek advice from an independent financial advisor if you're thinking of going down this route as, in addition to ensuring that an equity release scheme is suitable for you, taking this option could also have damaging consequences for things like inheritance and inheritance tax, should you have children that you are planning on leaving your estate to when you die. You'll also need to budget for future life-changing events that could occur as you get older. For example, should you ever need to go into a residential care home, if you get unwell to the point of not being able to look after yourself and to live an independent life, would your financial assets be able to withstand the cost of paying for residential care? Even if you've done all of your sums and have worked out that a house move might not just be financially viable but may also be quite an astute move, you should also factor in a financial 'buffer'. By this, it means that you should add in a healthy amount of cash which you might need to get hold of should you encounter a crisis of some kind. The unexpected can occur at any time and no one can expect to be able to predict their financial income and outgoings with complete certainty for the entire duration of their retirement. If you are married or have a partner, you're going to have to consider their needs too. Remember then that financial planning means covering you BOTH for all eventualities. One partner will inevitably die before the other, so you also need to ensure that the surviving partner will still be able to maintain a similar standard of living to what they have now should they be left on their own. If, however, a house move is something you wish to consider beyond retirement, the best thing you can do is to seek out as much advice as possible before making any decisions. 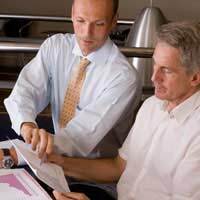 A professional independent financial advisor will be able to help you with this by considering all of the financial implications and tailoring solutions and providing you with suitable options which you can then determine if the house move you desire is going to be a realistic and practical option.